Blog and Ping to Attract the Search Spiders. ~ The Blog Doctor. 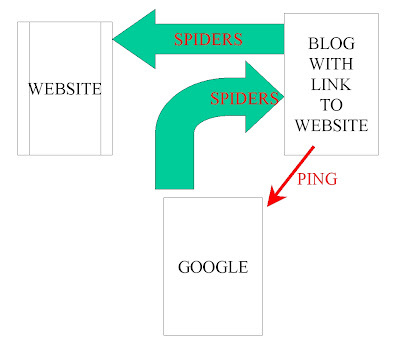 You are here: Home > Ping > Blog and Ping to Attract the Search Spiders. Blog and Ping to Attract the Search Spiders. After you start a blog or a site you want it to be indexed by the search engines so that anyone is able to find your site listed in the search engine results page when they search for it. There are millions of blogs and billions of sites out there so unless you adapt some techniques for fast indexing you will have to wait your turn till the spiders come to your site. You can submit your site to the search engines and then wait or adapt the Blog and Ping Technique. Similarly if you create a new blog put its link on one of your older blogs and it will be indexed faster than if you just submit it to the search engines. Also submitting blog link to a blog directory helps in faster indexing since they are crawled frequently by the search spiders. This is another marketing technique to increase traffic to your blog. A tag is a brief descriptive name given to categorize a post. They are like the tags attached to your luggage at airports. They serve to identify what is inside the post. In the New Blogger they are called 'Labels'. 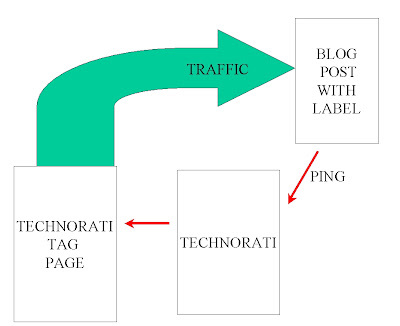 The method to follow in Tag and Ping is to create a blog post and label it appropriately and then publish it. To do this just add the label in the bottom frame of the post editor in Blogger before publishing. After publishing ping Technorati.com. You can do this by setting your blog to ping Weblogs.com under Settings----->Publishing------>Send Pings. You can also paste the URL of your post here and press Enter. 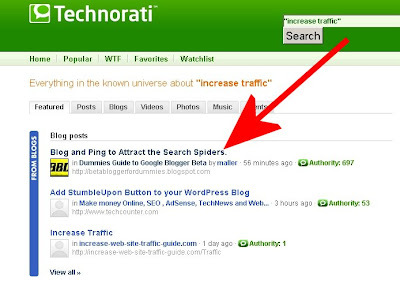 The spiders from Technorati will visit your post and place it under that tag on their tag page for that label. Blogger labels also double up as Technorati tags so you need not add them separately. When someone else writes a label under the same tag/label your post will move down the tag page. Click on picture to enlarge it. If you tag/label your posts with one of the Technorati "hot tags" your post will land up on the popular tag pages and attract traffic from there. Make sure that your post is about the tag otherwise you will be guilty of spamming. Before this post..i kinda has an idea what tags and pings wer meant for but never really knew how they worked. Now i have a much better grasp..thanks BBFD !! This is a well written, simplified explanation that confirms what took me a couple of months to understand. I have learned a lot from you. Thanks for taking the time to help others. Have you added blog to Google Webmasters? "Similarly if you create a new blog put its link on one of your older blogs"
dont get it ...do u mean my old blog posts ?? Suppose you create blogA in January 2008. Then in September 2008 you create blogB and you want it to get indexed by Google fast instead of waiting for some months. Simply put link of blogB in blogA. Now when you create a new post in blogA the spiders will follow the link to blogB and it will get indexed much faster than if it had to wait in line with all the newly created blogs of September 2008 to get indexed. When I say blogs I do not mean blog posts!